The ingenious and incredibly light Brompton Pentaclip allows stepless adjustment of the saddle angle on rail saddles. 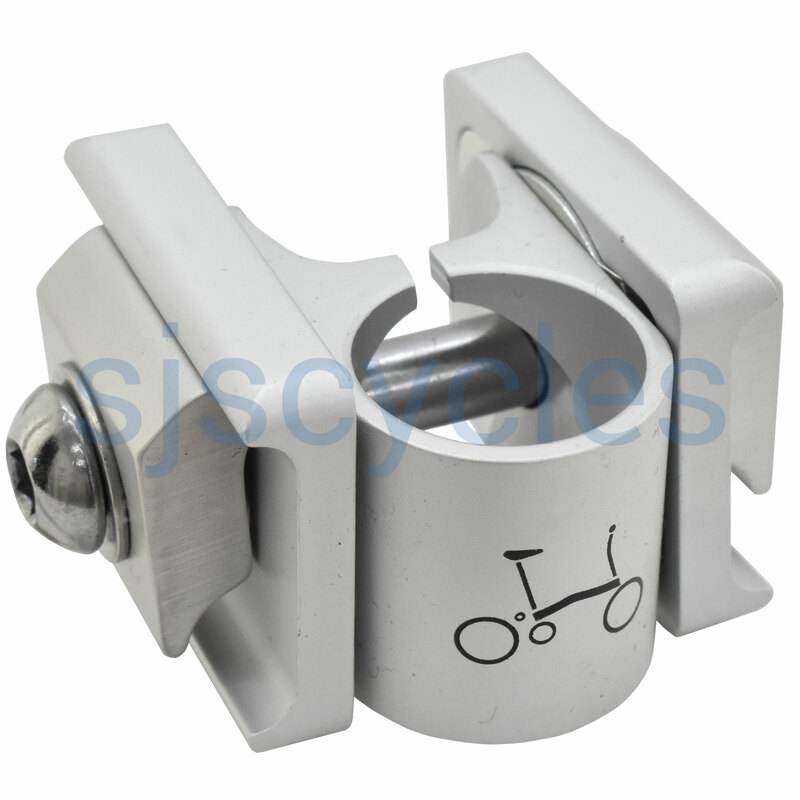 Fits to any Brompton ever made, enables you to fit any saddle with 7mm rails to your Brompton. Excellent clip for old style seat pins and single rail saddles. Quality, pricey but easy secure adjustment (allen key) to any angle. Bought as a replacement for the original (now very old) click/ratchet style saddle clamp, this is just so much better. The clickless adjustment means that the saddle can be located at precisely the right angle and the clamp seems to be cunningly made so that it doesn't slip. Maybe it seems a little expensive but when you see the quality you realise where the money goes. just wondering which diameter seat post the Pentaclip will fit. 22,2mm? Moving saddle back and forth? Is this adapter not available/produced any more (http://ep.yimg.com/ay/nycewheels/saddle-adaptor-pin-part-qsapa-10.jpg)? The rails of the saddle allow some adjustment back and forth, but unfortunately that adapter is no longer produced. You may be able to find something suitable online though. This clip in theory could be used to move the saddle forward, it would allow around 15mm of distance forward from the centre mark. Does Pentaclip Go With Any Post? I have a single rail saddle, but want to fit it on a Steco pinup saddle post with a near horizontal cantilever welded to it designed for very rearward saddle position. Can I turn the Pentaclip the almost 90 degree required and still have a stable connection? Weird configuration, maybe, but I would love to try out your clamp. You should be able to mount this Penta-clip at most angles and still be able to gain a secure fitting. the only thing to make sure is that the mounting part of the seatpost is 22.2mm in diameter. I have a brookes twin rail from a Pashley roadster, I have since acquired a dutchie dapper and would love to use my saddle on this bike. This Brompton Penta-Clip is actually only designed for single rail saddles and will not work with your twin rail saddle I'm afraid. The only thing I can recommend is running something like a modern micro adjust seatpost with one of our adapters SJSC part 28524.
what's the weight of the Brompton PentaClip? The Brompton Pentaclip weighs 120 grams.